This is a production SERE 2000 that I have made Damasteel blades for. I did a limited number for the 2010 SHOT show. This is a photo my daughter took while she was home visiting at Christmas. 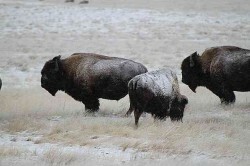 Living in Wright we are blessed with a large buffalo ranch near town. The Durham ranch has over 1000 head and on occasion they are near the road and pose for pictures. The buffalo is a prairie icon and a symbol of the west, for that reason I have included it in my picture mosaic knife series. 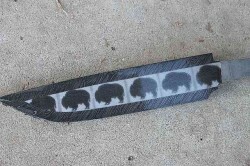 This is the blade that will be the Where the Buffalo Roam Bowie. 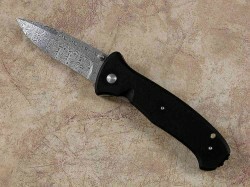 It is 1 1/2″ wide and the blade will be 7″ long. Mosaic buffalo tiles down the middle with explosion damascus wraped around the edges. In a future blog I will show the steps that have brought the blade to this point.